Japanese classification society ClassNK has granted Approval in Principle (AIP) to a new H2/CO2 FPSO (floating production, storage and offloading) design developed by Mitsubishi Heavy Industries (MHI) and Chiyoda Corporation. FPSOs are commonly used in the offshore oil and gas industry process and store crude oil and liquefied gas from offshore wells until it can be transported via pipelines to shore or via ship-to-ship transfer. This new concept H2/CO2 FPSO, however, uses steam reforming and shift conversion to extract hydrogen (H2) and carbon dioxide (CO2) from the associated gas produced as a byproduct of oil well production. There is growing interest in the use of hydrogen as a fuel, and research is ongoing around the world. The storage and transport of hydrogen continues to present a number of difficult technical challenges for industrial and commercial use. In order to address these challenges, the H2/CO2 FPSO uses a new organic chemical hydride method to convert hydrogen into highly stable methylcyclohexane (MCH), which can be stored in liquid form at an ambient temperature and pressure. As MCH can be transported in standard chemical tankers, converting hydrogen into MCH not only reduces the risks and challenges related to hydrogen storage, but also optimizes it for transport using existing transportation networks. MCH produced by the H2/CO2 FPSO could then be transported by chemical tankers to hydrogen demand sites and converted back to hydrogen using a dehydrogenation reactor developed by Chiyoda. The carbon dioxide extracted by the unit would be stored onboard and be used for enhanced oil recovery (EOR), a commonly used process that uses gas injections to displace and subsequently extract residual oil from subsea reservoirs. The facility’s topside plant and floating body were developed by Chiyoda and MHI respectively with support from ClassNK’s Joint R&D for Industry Program. The new design is understood to be world’s first H2/CO2 FPSO design, as well as the first such facility to receive Approval in Principle. Approval in Principle (AIP) is an essential step in the process of developing conceptual designs for practical application in the maritime and offshore industries. 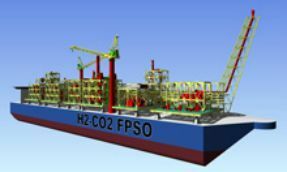 As part of the process, ClassNK conducted a review of the concept design, including both risk assessment and a review of structural and topside plans for the H2/CO2-FPSO to ensure the design complies with both ClassNK’s independently developed rules and relevant international regulations and standards.